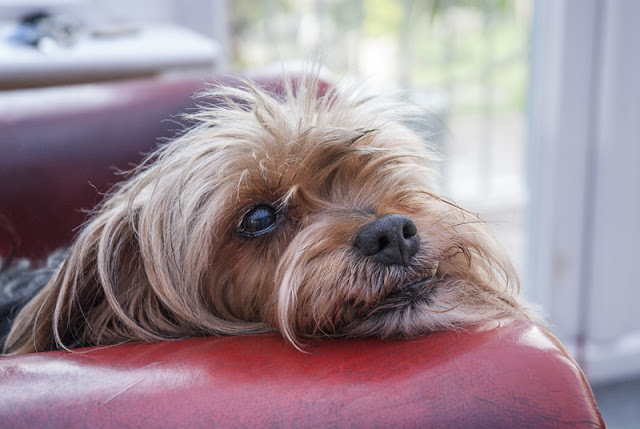 If animals have to be anaesthetized for an EEG to occur, it’s a problem because a drowsy brain does not function in the same way as an alert brain. Awake animals are typically restrained. For example, Hanlu Ma et al (2013) anaesthetized cats and surgically implanted metal tubes through which electrodes could be inserted. After the cats were given a couple of weeks to recover from surgery, the electrodes were used to test the cats’ responses to meows and to human voices making vowel sounds. The cat’s body was wrapped in a cotton bag and its head was immobilized while the sounds were played. The cats were trained for this (though the paper doesn't say how) and monitored for signs of distress. The results showed which parts of the brain were activated, and found no significant difference in response to meows and vowels. In this study, the cats were awake. But it is still invasive, since they had to be operated on and were restrained for several hours at a time. Could there be another way? Since dogs are easily trainable using operant conditioning, Kujala et al in Finland thought it might be possible to train dogs for EEG. 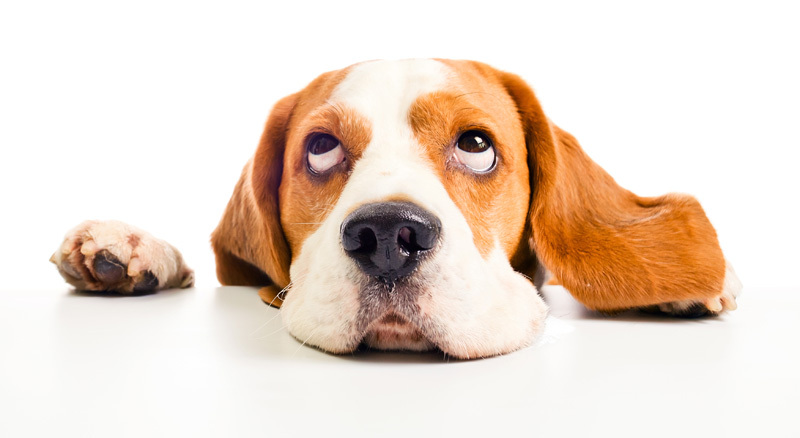 Using positive reinforcement, they trained eight beagles to take part in their study. The beagles were purpose-bred for laboratory work and live in a group kennel environment. First of all they took part in training. For the study, their heads had to be shaved, cleaned and prepped so that electrodes could be applied. They wore seven electrodes on the head, one in each ear, and a ground electrode on the back. Then they had to lie still and look at a TV screen while measurements were taken. At the same time, they also wore eye-tracking equipment. The experiment itself took place in twenty-minute sessions over four days for each dog, so that they did not get too tired. Of course, it took much longer to train the dogs to get used to the laboratory and the equipment in the first place, with twice-weekly training sessions over one and a half years. The dogs were shown photographs of human and dog faces, mostly the right way up but with some upside-down. They were shown a batch of photos, then had a short break in which they were rewarded with some food, then led to settle down and watch another batch. The authors point out that the experimental set-up is very similar to that used in human studies. 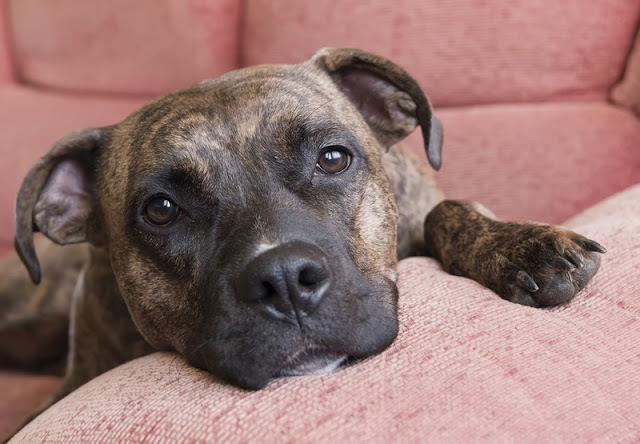 The results showed a change in a type of electrical activity called the beta range (15-30Hz); oscillations in this band were suppressed when the dog was looking at a face, compared to the rest period. This probably reflects the activity of a part of the brain called the occipital cortex. In addition, the researchers found a suppression of activity at the 2-6Hz range. This coincided with the beginning of looking at an image, and was noticed most in the sensors at the front of the head. The authors say this may relate to eye movements as the dog looks at an image that has just appeared on the TV. There were individual differences between the dogs which is not surprising, as this is also the case for humans. ﻿This is similar to the study by Gregory Berns et al that was published last year. They trained two dogs – Callie the rescue feist and McKenzie the agility-loving border collie – to take part in an fMRI. They began training the dogs using a mock-up of the equipment before moving on to the real version. After two months, they were able to take part in the fMRI study. Each dog had to keep absolutely still; if they moved by as little as 3mm, it would make the data useless. The picture shows Callie during a training session (A) and McKenzie during the study itself (B). The study found that the reward centre of the brain lit up when the dog saw a hand signal that meant a treat would soon be forthcoming. 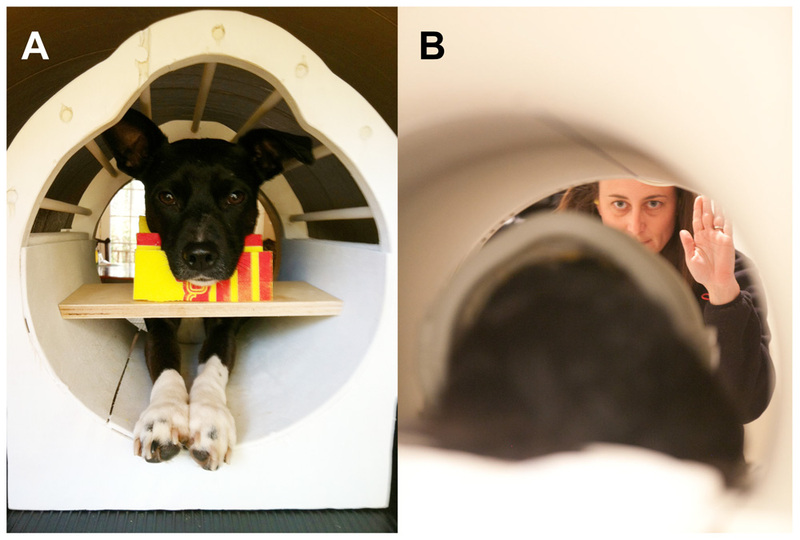 These EEG and fMRI studies are a tremendous achievement on the part of both the humans and dogs that took part. So how were the dogs trained? They did not use electric shocks or ‘corrections’ or punishment. Instead they relied on positive reinforcement. 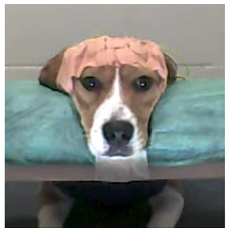 (You will have noticed ongoing positive reinforcement in the EEG study, with pauses in which the dog was given a treat before returning to the experiment). 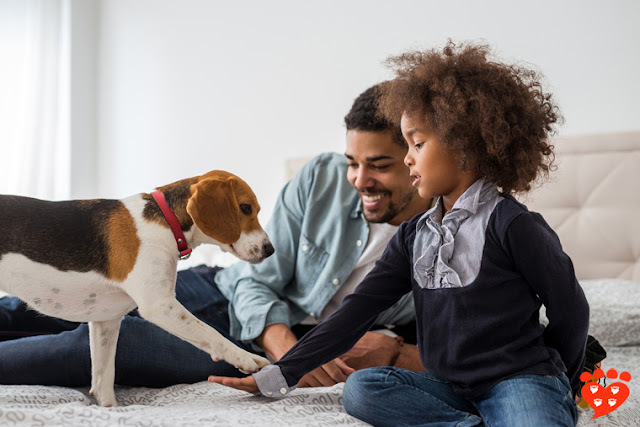 These two studies were designed to find out about the canine brain, but they also show the effectiveness of training using positive reinforcement. 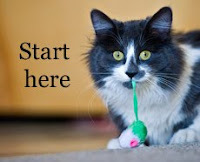 Some people (even some dog trainers) try to argue that positive reinforcement is not the right way to train a dog. And yet, it has been used to train dogs to take part in an EEG study and in fMRI without the need for sedation or restraint. Isn’t that amazing? !